The qualifying period for the awards runs between 1 January 2018 and 30 November 2018. Points are awarded for all Grade 3 contact agility and grade 3 non contact agility rounds, in all height categories, for events run under a KUSA open show or KUSA Championship show license, throughout South Africa. No demo events are included. Standard course times are calculated at 3.8m/s for contact agility and 4.0m/s for non contact agility. The top 10 contact agility rounds and the top 10 non contact agility rounds for each dog count toward their score. This set of points shows you exactly who the current agility front runners are in South Africa in the small, medium and large categories. This will be updated in every second issue of Animaltalk, and you can keep an eye animaltalk.co.za for more agility updates. 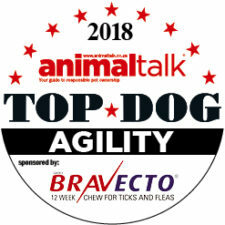 Agility will be a permanent category in the Animaltalk Top Dog Awards going forward and participants can look forward to a competitive points ranking, keeping them at their most competitive levels.